Why use RAYMOND R. PINES? An effective, honest, and caring mediator can help. 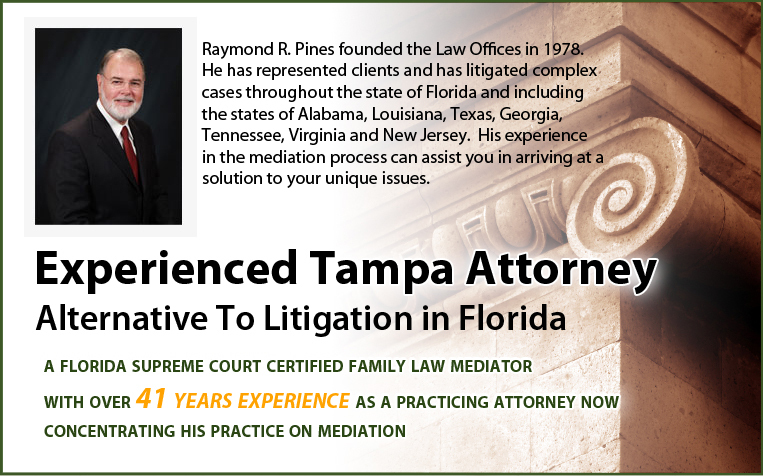 Raymond R. Pines, a Florida Supreme Court Certified Family Law Mediator, can assist you in arriving at a solution to your particular needs or issues. The mediator does not give legal advice, but can ask the appropriate questions on the issues or act as a guide to help you arrive at your appropriate agreement. In your divorce or paternity case, Raymond R. Pines, as your Mediator, acts as a neutral person whose task is to facilitate the voluntary resolution of a dispute between two people. Therefore, during the mediation session the two parties, their respective lawyers or accountants, if any, explore settlement options and opportunities. At Raymond R. Pines we stress that "decision making authority" in the mediation process rests with the Husband and Wife, or Mother and Father, and not a Judge. Also note that as your Mediator, Raymond R. Pines cannot serve as your attorney. If you or the other party is not represented by an attorney and you have doubts about your legal rights on a subject, then it is advisable to seek a legal opinion from the attorney of your choice. The attorney can then review the issue for you from a legal perspective. Some courts order the parties to mediation once the litigation process has begun, but you can mediate your issues prior to litigation. This can be quicker and much more economical than litigating through a trial of your issues. An effective mediator is a good start to relieving you of the stress of dealing through the court system. Mediating a settlement for your divorce or paternity settlement case rather than court litigation can result in a much quicker resolution of the divorce. Scheduling a mediation session or sessions is much easier to arrange than trying to fit your schedule or needs into the court calendar. Raymond R. Pines can also analyze the situation of the parties and strive to find options for a successful resolution. With nearly four decades of experience he is able to bring to the table differing alternatives for the parties to consider. He is qualified to write a clear, concise, and understandable agreement in plain language. Raymond R. Pines is a Supreme Court Certified Family Law Mediator who is patient, creative, persevering, and non-judgmental of the participants. He engages and empowers the parties to seek alternative or creative solutions to the issues, perhaps an alternative that wasn't previously explored by the parties. Sometimes, he must offer a reality check to the parties' proposals if the request is unrealistic or impossible to accomplish. The mediation process allows for a more open line of communication or re-establishes a line of communication. A byproduct of the mediation process is that some parties may find it appropriate to cancel their divorce. This does happen and it should be perfectly acceptable to your neutral mediator. Mr. Pines can assist you in reaching an amicable solution in your divorce or paternity case. He can also assist you in finalizing a paternity plan, as well as, a settlement agreement incorporating the parenting plan, division of assets and liabilities, alimony (if applicable), stipulation of paternity of a child, parental responsibility, timesharing, and child support calculations. He is also pleased if the parties decide to reconcile.